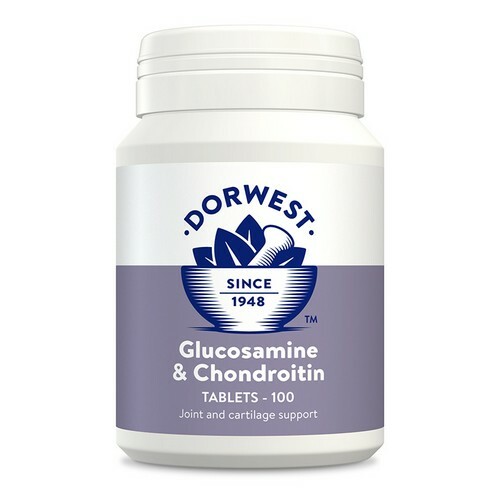 Dorwest Herbs use top quality Glucosamine hydrochloride (HCL) in this popular joint supplement because it is better absorbed by dogs and enhances the body's ability to manufacture collagen and proteoglycans. These are essential for rebuilding joints and increasing synovial fluid to lubricate the joints. They have chosen not to add lots of additional things into this formulation, but to simply produce a top quality supplement with pharmaceutical grade Glucosamine and marine based Chondroitin sulphate. Healthy animals produce enough Glucosamine themselves to keep their cartilage healthy, but in older animals where wear and tear is starting to cause problems or following injury or damage they often require a little bit more to keep their joints healthy. Chondroitin has a number of functions but ultimately works synergistically with the glucosamine. Also available in 200 and 400 tablet pots. 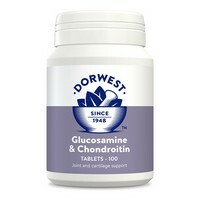 How Many Glucosamine & Chondroitin Tablets Do I Need to Give?